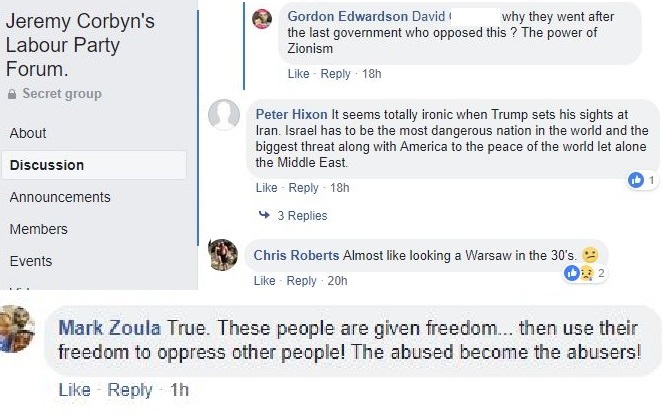 Regulars on the forum may not be members of the Labour Party and it seems likely that many are posting from abroad: North and South America and from the Middle East. Nevertheless, the administrators describe themselves, just under the header picture, as defending the integrity and objectives of the Labour Party. I include this group statement in many of my screen shots. I am posting here the collages which I made to get as much as possible on each image. I still have the raw screen shots, but these are so numerous as to be unwieldy. The posts shown here appeared on the Truthers forum from October to December 2018 and are ongoing. I’m putting the most recent image first. The context is that Israel’s unmanned spacecraft Beresheet made a crash landing on the moon the previous night, 11 April 2019.